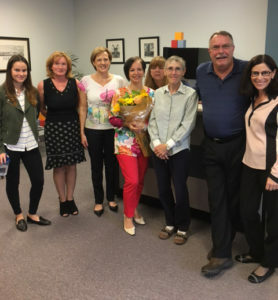 Long-time Base Consulting Office Manager retires! | BASE Consulting and Management Inc.
Long-time Base Consulting Office Manager retires! Nina Freitas started to warn us of her impending retirement a few years ago! Our long-time Office Manager has been such an integral part of our team and has helped guide us and grow us to where we are today, that we couldn’t quite get our heads around this news. AND she looks so young! We wish Nina every happiness in her retirement and look forward to hearing about her adventures. Look who crashed our client conference in Montreal! Delegates get up to the craziest things!